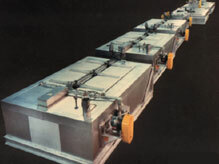 The ovens shown are TOP LOADING BATCH OVENS, used as die heaters. The oven in the foreground is an electrically heated, (2) two-chamber convection oven, with gravity vent, and pneumatically operated doors. Each chamber is capable of raising 6,000 lbs. of die to a temperature of 600°F in four hours. The approximate dimensions of this unit are 17 feet long X 8 feet wide X 4 feet high. Processes and products vary. While this unit may, or may not, be suitable for your application, it is one of a staggering number of heat processing solutions provided by FECO.